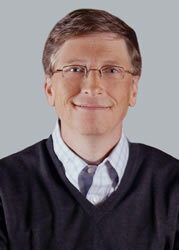 Bill Gates, the founder of Microsoft, is currently the world’s richest man. He had temporarily lost that position to Carlos Slim of Mexico in 2009, but regained it in 2013, as his company’s shares surged to a five-year high. In 2008, however he was ranked third. The fact that Bill Gates’ position on the list keeps changing is in reality due to his extreme philanthropy. In 2000, he co-founded the Bill & Melinda Gates Foundation, with his wife. The foundation has since donated large amounts of money to various charitable organizations and scientific research programs. In fact, according to an Associated Press report, by 2011, Gates had given away more than one-third of his wealth to the Bill and Melinda Gates Foundation. Gates was born William Henry "Bill" Gates III and is an American business magnate, investor, programmer, inventor and philanthropist. He co-founded Microsoft with Paul Allen, and is the company’s chairman. Microsoft has gone on to become the world’s largest personal-computer software company. I wish I would be like you. please make donations to the poor. BLESSED IS HE THAT CONSIDERS THE POOR:THE LORD WILL DELIVER HIM IN TIME OF TROUBLE; THE LORD WILL PRESERVE HIM AND KEEP HIM ALIVE..............? nice to see you on top bill gate,keep it up..help the poor,and you have being doing it...you are my mentor ..i will like to meet you as a person .however remain bless and keep doing it.and shower the bless to me.thanks. prayers, sacrifice and hard work ma ambitions will come true Insha'Allah.......pray 4 mi. God bless you Bill Gate for help poor people in the world. Be blessed for ever in Jesus name. my god bless u, i will to do the same in botswana for the bush men and the need, by building houses and crushing all the mud houses,please make donation so i can help my fellows out here africa botswana.